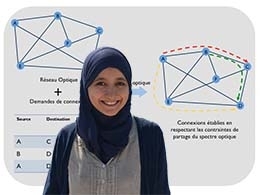 Fatima Zahra Moataz is the recipient of an accessit to the PhD prize Graphes “Charles Delorme” 2016 for her PhD thesis entitled Towards Efficient and Fault-Tolerant Optical Networks: Complexity and Algorithms. Congratulations ! The prize will be announced during the next Journées Graphes et Algorithmes — Paris, November 17, 2016.